Barcelona is a fascinating city and there are many things to see. Here is a list of some of Barcelona's most popular sights. 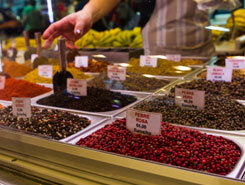 A visit to the Mercat de la Boqueria in Barcelona, which is just off of Las Ramblas, is not to be missed. By entering the Boqueria its visitors are diving into a world of fresh fruits, vegetables, fish, seafood, meat and much much more – an ocean of colors and bustling activity. Housewives, chefs of the top restaurants in Barcelona and visitors from all over the world are strolling here through the corridors between the different stands offering the best products from Catalunya. The beginnings of the Boqueria were back in 1217. At this time, there were just some tables for selling meat. In the end of 1217 this little “market” turned into a pig market and got the name “Mercat Bornet”. When demolishing the city gate, the market was moved into the garden of the monastery Sant Josep. When the monastery got demolished in 1835, a square got built, similar to Plaza Reial and in 1840 the construction of the iron hall started under direction of architect Mas Vilà. 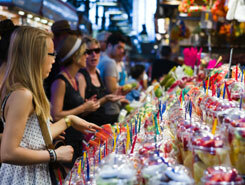 Designed was the Boqueria Market by Antoni Rovira, Josep Fontseré and Josep Cornet. In 1914 the market got a metal rooftop and a decorative entrance with beautiful colored glass elements. 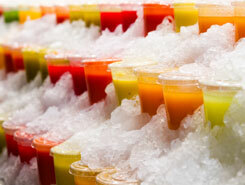 The Boqueria is the best place to get fresh and high quality ingredients for lunch or dinner, perfect for some fruit juices or a fruit salad in the morning or some Tapas in one of the Tapas bars in there in the afternoon. It is a paradise of food and colors – for children and adults – and a good place to get some Spanish specialities, such as sausages from Vic, cheese from the Pyrenees, fruits from Lleida, vegetables from the Maresme or mushrooms and truffles from the catalan back country. If you want to try some great Manchego cheese or Iberico ham – this is the place. Notice: Take care with pickpockets in this market since it is always quite crowded there and you get distracted easily by all the great things offered.